Did I let Jemma circle her little heart out when the Toys R Us Christmas catalog arrived last week? Of course I did. I’m not the mom version of Wicked Witch of the West! But, when it comes down to what I’ll actually be spending my money on this Christmas, it probably won’t be found in that catalog. For one, I’m all about practicality and at this age all my kid’s want to do is open presents. The contents aren’t super important. New socks? Woohoo! Toothpaste with their favorite character on the bottle? EEK! A framed family photo for their room? Hey, that’s me! Anyways, my littles use and love technology as much as the next. I consider it a necessity for my sanity most days, but when we find and love a tech free toy I call it a win in my mothering book of life. I don’t actually have one of those, it just sounded right, feel me? So, may I introduce a few lovely ideas for a tech free Christmas? Of course I can! And you, you wise mama who is also thinking ahead for Christmas, comment with your favorite tech free gift ideas! ONE /// Awhile ago I mentioned on Facebook how much time Max spends playing with his Squigs. The perfect toy for our glass slider while I prep dinner and avoid making eye contact with anyone who dares spark the witching hour. TWO /// Poke-A-Dot, literally. This line of books is just brilliant! THREE /// Who has a little girl or boy with Frozen on their Christmas list? I’ve fallen in love with this wood memory game from Ella & Ezzi. It encourages learning and fun – the perfect pairing. Even better, Ella & Ezzi is a mama made shop! You all know how I love supporting mama businesses. With over 20 designs you’re sure to find a perfect one for your kiddo. Beautifully made AND it comes gift wrapped. Can’t beat that :) Be sure to like Ella & Ezzi on Facebook, I’ve seen giveaways popping up on occasion! FOUR /// You all saw my mini review of Strider Bikes, right? They really are great and the age range allows this to be a gift that gets a lot of use for quite a few years. Plus, the sturdiness insures that a younger sibling will also get the Strider love. P.S. This giveaway campaign will make your heat soar! I love companies who emulate true kindness. FIVE /// Dollhouses are such classics. Jem plays for hours with the one she got for her birthday and so I’m considering adding to the neighborhood with the treehouse! SIX /// Kid’s love kid size things and I can’t get over the perfection of this table and stool set from KidzPad. Totally a practical Christmas gift that will get hours of use. Plus, such a bargain! We have this piece in our newly rearranged Jemma/school/play room (think Peter Pan nursery style where all kid items are now in one giant room) and the quality is impeccable. You can’t go wrong with any of the KidzPad pieces. This would be a real winner for a practical gift too! Chime in! What tech free toys do you love? 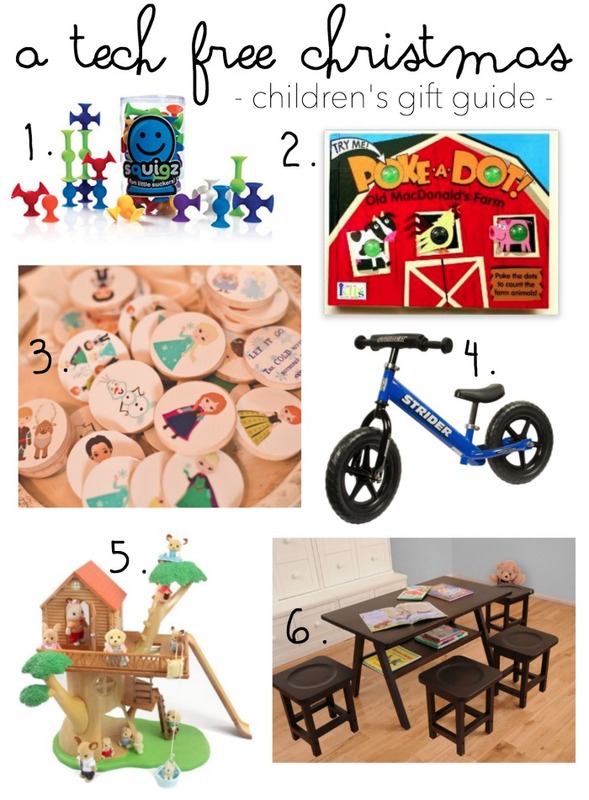 This gift guide included some items from wonderful That Mama Gretchen sponsors, all opinions are my own. Amazon affiliate links used as well. Thank you for supporting the shops and affiliates that support my blog!